A condition is a test that can be evaluated to either true or false. A condition is made of three parts: one operator and two operands. In the condition if #location.raw is Paris, the left operand is #location.raw, is is the operator and Paris is the right operand. As a left operand, you can use any value of text analyse (intents, entities, ..) from your user input and any value from the conversation state (the last skill, memory values..). Note: you can write the entire path if you need, like: #location.lat (if you need the latitude) is the same as nlp.entities.location.lat. Or if you need to access the description of the first intent detected: nlp.intents.description. Note bis: greater-than and lower-than only works with numerical values. The right value can either be a free input or a finite list depending on what you’ve picked as the left operand. 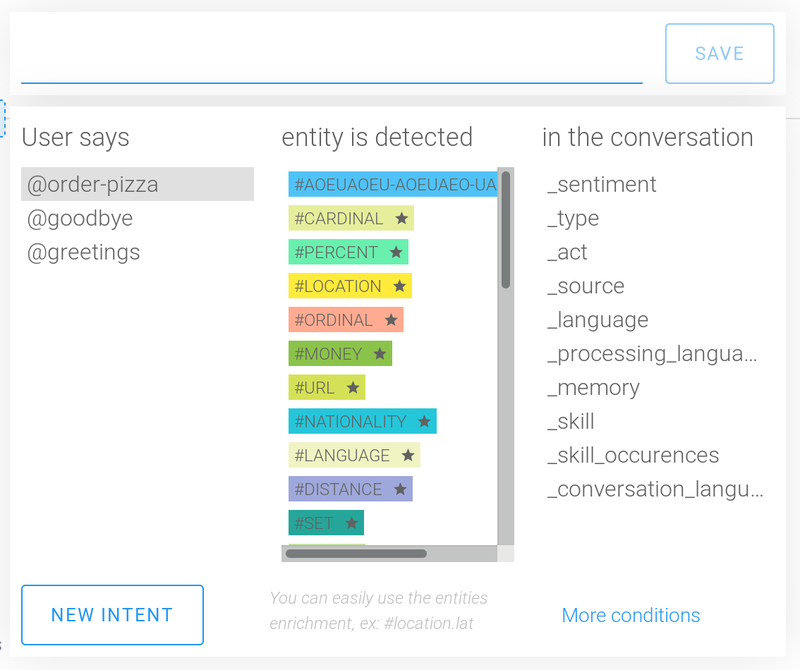 For example, if you’ve picked sentiment, the right operand will be limited to what the SAP Conversational AI API can return (in this case, from “very positive” to “very negative”). But if you’ve picked _memory.my_value.my_key, any format is supported because it’s not dependent on the SAP Conversational AI API. You can find more details on the entities’ enrichment and the other keys with a finite list of possible values in the MAN. You can create multiple layers of condition using and and or.